The Polymath Chronicles: So. Much. News. Buckle up, this is going to be a doozy! First off, I want to thank all of you who pre-ordered my new digital cookbook Big Delicious Life. It should have been delivered to you wirelessly on the 21st. For those of you who have not yet pulled the trigger, welcome to instant gratification! You can get yours HERE. It's only $3.79, kids, and has not only over 150 recipes, including over 40 that have never been printed, but it also has a chapter of my new novel Recipe for Disaster, to give you a sneak peek at what is coming your way in March. 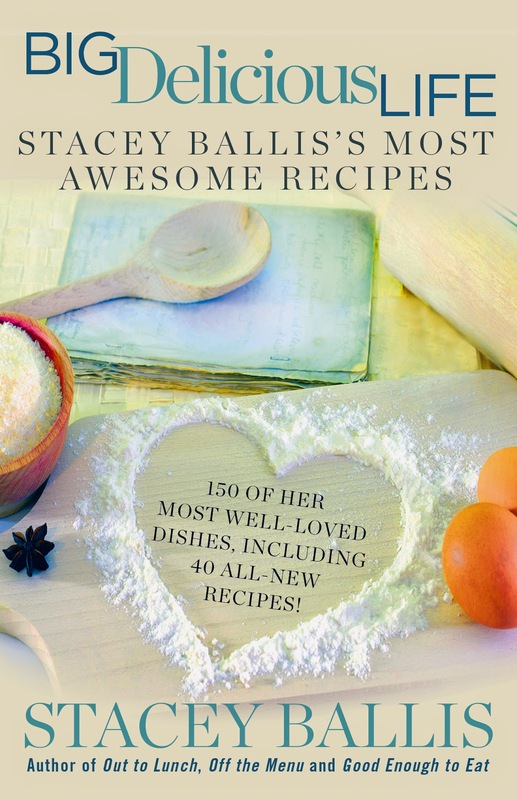 Makes a great gift for a foodie pal or relative, and there are plenty of holiday centric recipes for the upcoming celebrations. And if you've ever cooked one of my recipes, either from the novels or from here on the blog, it would mean the world if you would work your social media network on my behalf. Now, are we ready for a house update? I bet we are! Much to report from here at the castle. The Matts have left the building. Yep, all eight of our strapping 25 year old tenants headed out last week for new digs. They were a fun bunch, consumed their collective weight in pizza, beer and Mountan Dew on a weekly basis, and generally made it not horrible to play Mrs. Roper. We have found a new group of tenants for the third floor, who will move in next week, and we are looking forward to getting to know them. The concrete floor in the basement FINALLY cured, and so we polished and sealed it. ISN'T IT YUMMY? I wish you could feel it. It is like one huge river rock. The first chance we got, we ran around barefoot. I have never been barefoot in my basement EVER. Not since the day I moved in. It was strangely gratifying. The floor looks a little shinier in the pics than it does in real life, the finish is more of a matte glow. Now that the floor is done, we can start framing up walls and really pulling stuff together! In the meantime, with the decampment of the second floor Matts, we were able to start the demolition where the new eat-in kitchen will be. Now, I know you are probably looking at the "before" and thinking "Those are lovely spaces! Why on earth would anyone turn them into something that looks like Beirut?" And the answer is, because your Polymath needs a great kitchen that is bigger than a postage stamp, where she can cook with her Charming Suitor and not elbow each other in the eyeball. A kitchen with actual counter space. We salvaged all of the woodwork and built-ins for re-use elsewhere (stay tuned for those projects), and are now dealing with the information resulting from the demolition. Because as anyone who has ever renovated a home over 100 years old knows, there are always surprises. Sometimes good, sometimes bad. We got very lucky in the basement, no bad surprises at all. But what we have discovered here does create some challenges. We knew that the construction of the building was steel, so YAY! Won't fall down! We assumed that the floor joists would have been laid out on TOP of the steel beams. Demolition revealed that not to be the case. The floor joists are all laid out directly into the beams. Which creates some serious issues in how we had thought to lay out our plumbing runs and HVAC ductwork. Usually these things go between the joists. On top of the beam. Since the joists run INTO the beams, all of the runs we planned would run smack into the middle of steel beams. Not functional. So we are meeting Monday with our contractors and our architect to come up with some solutions. Closets were a later addition to the building, in 1907 people used armoires and such to store clothes. In this room, they added two side by side closets, one of which contained a small window. Because nothing is better for your best duds than constant access to direct sunlight. By removing half of the closet, our guests will still get some closet space, but what feels like a much bigger room! We have a beautiful English Arts and Crafts tall dresser with a mirror that will fit beautifully in this nook. Buried under layers of ghastly linoleum, and partially demolished from previous plumbing work, we are very sad that we can't salvage it. I love that the accent tiles are blue instead of the more common black, and would have loved to just restore a floor like this, but not enough of it survived, so we will be looking into other options. But it was very cool to get to see it, and we are going to try and save some of the cove tiles that are along the baseboard just for our "treasures" box. Things are going to start to move pretty quickly over here, so stay tuned for much more frequent updates! Oh yay a post about recipes and renovation, two of my favorite topics! I have a small library in my new (to us) circa 1875 home. And yes, old homes always = surprises. I love the original tile you uncovered. Maybe you can do something similar yet updated? I'll be following along. Beirut. LOL funny.